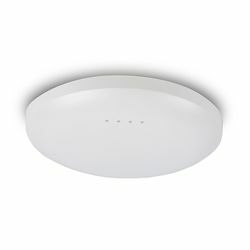 Completely hide your internal antenna OM2P access point with a dome-shaped ceiling enclosure. Designed to snap to 9/16" or 15/16" drop ceiling rails, it can also be mounted to any solid wall or ceiling... all three mounting options are included. Includes three mounts. Requires internal antenna OM2P router (like OM2P-LC or OM2P-HS). Does not fit OM2P with external antenna.